Rosewood Roundup: "No Stone Unturned"
Welcome back, friends! After a torturous two weeks, we’re finally back in Rosewood! Here’s what they threw at us this time. “Leslie Stone. That’s crazy!” Yeah, I know. Right, Emily? While I am totally not on board with that and neither is Emily, Spencer is 100% convinced that A must be Leslie because of how Mona was treated so well in the dollhouse. Emily questions how it’s possible for Leslie to have the capabilities to fill an entire bunker with more spy equipment than the CIA. She reminds Spencer that they can’t keep jumping to conclusions like they did with Andrew just to reach an answer. Hanna comes in and asks if they’re accompanying her to Philly to creep super hard on Leslie. The entire dollhouse experience has hardened her and she’s definitely the one who’s keenest on catching A when the other girls are worried about other things. Emily has therapy, but Spencer agrees to go along. On her way to therapy, Emily is stopped by Papa D. who looks like he just saw a ghost. He found a card on his windshield and asks Emily if she saw who did it or if she’s seen anyone outside the house in the last hour. Dude, she just rolled up. She’s not on patrol duty. Chill out. Whatever was on that card definitely rattled him and you can tell. While Aria is caught sneaking Clark’s photos back into his cubby at Hollis, Hanna is making calls and doing all the research she can on Leslie. She’s still being icy towards Rosewood’s Disney Prince and it’s getting tiresome. He references the lump on her neck and I’m practically beside myself to see my prediction from a few weeks ago come to fruition. 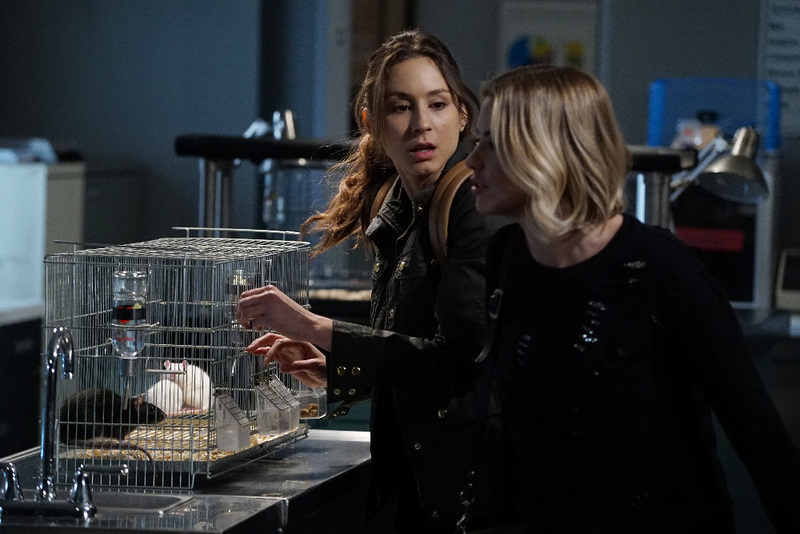 Hanna tells Caleb and her mother that she’s going with Spencer to an appointment in Philly because they’re “using the buddy system just like you asked us to.” Really, Hanna? Really? You’re going to use it NOW? What about in seasons 1-5? How about every Halloween? Ugh. I digress. Something seems to be brewing between Emily and Sarah. Did you see the way she looked at her when she had her sweater off? I see you, Emily. You’re not sly. Dean comes to bring Spencer a book that his sponsor had given to him years ago. He asks if she’s been sleeping, even though we all know the answer is that she hasn’t. He continues being the greatest person ever and brings her a box of brownies to make up for her faux pas at the meeting. What a gem. Melissa texts Spencer at their mother’s insistence about graduation in the hopes that Spencer will take the opportunity to speak at the ceremony. Wait, she’s always skipping class, was gone for over a month and they still want her to speak? Dang. Must be nice to be a Hastings, am I right? Spencer gets vulnerable for a second and questions how it’s possible for her to do that when she’s not doing too hot (see?) and wonders how she can talk about being a survivor now that the pain is over when it’s not. Dean tells her to say no. Spencer is rightfully confused as everyone around her pushes her to do what she doesn’t want to and here’s this guy telling her not to do something if it makes her uncomfortable. She hurries him out and says she’ll see him later at the meeting. Sarah has her first day of work with Caleb and is totally lost in his tech and pop culture speak. He gets awkward for a second but she covers for him by saying she has a lot of catching up to do. He’s glad she has the girls to help her out. Something the girls can’t help her with: answers about Alison. Sarah asks Caleb about her because every time she asks Emily, she shuts down. She figures if she was made to act like someone, she should probably know more about her. She wonders if Alison knows who’s done all of this to them. Side note: I could totally back this friendship between Sarah and Caleb. I dig it. While Hanna, ever the clever girl, is in Philly trying to convince the valet to give her the keys to Leslie’s car, someone comes into the coffee shop looking for Emily. Ezra tells the woman that Emily doesn’t work there anymore, but that he could pass along a message. She introduces herself as Nicole, Emily's supervisor for the housing project in Haiti. She’s worried about Emily because she changed her number and email and is totally confused when Ezra said that she had to "after the trial." “When was the last time you two spoke?” Good job, Ezra. This will be a fun conversation. Not. They find a box full of glasses and Hanna is convinced she has always needed glasses after putting a pair on. Just kidding. “These are fake! God, she’s fooling everyone.” Thanks, Spence. When they open the back of the car, they see a stack of boxes labeled Animal Cage. Spencer tells Hanna, “There’s four boxes. They’re big enough for US.” Could they be right? Could she be waiting to use them on the girls? I don’t know about all that. Back at the junkyard, Clark asks Aria if they’re any closer to figuring out who’s been torturing them. Aria says they’re close. “But how can you be sure?” Clark asks. Instead of answering, the two split up (bad idea) and Aria sees a doll on a shelf and when she flips the skirt, it’s the Aria doll that A was working on at the end of the last episode. Is A nearby? It’s obvious A knew where she was, but how did he/she get there in enough time to strategically place the new doll in her line of vision? Emily meets up with her old supervisor and she asks for her help on an eight week project in Thailand. It starts “mid-June. So you can just fly there in your cap and gown.” Emily has reservations about saying yes but after recalling how she had gone to Haiti a mess but ended up finding happiness in helping others, she immediately agrees and duh, of course asks if she could bring Sarah. Spencer goes to get a copy of Leslie’s keycard made and asks Sarah if anyone ever asked her to talk about what happened. The two have a very interesting conversation about their experiences in school, which has Spencer telling Sarah that school was all just a bunch of wasted energy. Sarah tells her that if she would have given more attention to school, maybe she would be able to fully explain to someone what they went through down there. This clearly makes Spencer rethink the speech. Ashley and Caleb also have a nice conversation about how Hanna might never tell them what she went through. Caleb doesn’t want to smother Hanna, but Ashley reminds him that Hanna likes to keep everyone guessing. Maybe they would be better off just treating her normally instead of like a China doll. Elsewhere, Aria questions how A knew where the girls all were and again, my prediction from a few weeks ago is coming back into play. Before Aria can say anything else, Ezra knocks on the door. Does anyone else miss these two being together? Because I suddenly do. Ezra spots the doll in her bag and instead of being honest, she lies to Ezra and said she used it for photos. He correctly states that it’s disturbing. Dean is stranding at Spencer’s gate because she clearly missed the meeting. She doesn’t understand that he was checking on her to make sure she was alive and all she can think about is that she decided to give that speech. This is one of the few times where PLL shows how inconsiderate Spencer can be in regards to someone else’s feelings. Dean says he can’t see her anymore because he can’t stand not being able to grab her and kiss her. Well, what a plot twist. Emily walks into her home and sees that Sarah is scrubbing the carpet and isn’t speaking totally coherently. Noticing a cut above her eye, Emily asks what happened and Sarah says she isn’t sure if it was an accident or not. She was on her way home and she felt like someone was following her. A dark car was following her and hit her elbow with the side mirror. Emily tries to calm her down and asks if Leslie’s car was the one that was following her. Something still seems off about the Sarah situation and I can’t quite put my finger on it. If we could just get some background on her, I’ll feel a WHOLE lot better. AHA! I told you guys that they had trackers in their necks. I knew it. There was no way A could have known where each of them were unless they were being tracked. Oh, god. It feels good to be right and it was torture waiting to see when it would come out in this episode. Oh, sweet victory, Self high five. “We can stand here all day reliving A’s greatest hits, but we still need to find something to give to the police.” Ah, Spencer. Sometimes you really stand out for me. While Emily tells Nicole that she can’t go to Thailand because her friend is still stuck in a nightmare (just like they all are) and Nicole points out that duh, Emily has feelings for Sarah, Hanna goes on a solo mission and has some crazy flashbacks of the dollhouse which leads her to set the animals in cages free. A raccoon is out of the cage and the lights go out when they try to get it back in its cage. Ugh, Mona. What are you doing here? Mona followed them there and doesn’t respond to any of the allegations the girls are throwing at her. She claims she’s trying to save their backs, but they’re not buying it. Mona tells them that all Leslie is pretending to be is stable. That’s why she didn’t want anyone to see the file. She hated Bethany Young and only heard Charles’ name once; the night that Bethany escaped, it seems Charles did too. “But Charles was already dead by then.” Maybe not. The guards were looking for two patients that night when it went on lockdown; Bethany and Charles. Mona, apparently smarter than Spencer, points out that the donor form is a sham. That list of medications would have destroyed his liver, making him ineligible. Remember that card that Papa DiLaurentis found on his car? We’re circling back and see him on the phone in his car asking someone about Charles. We see him cross another name off a list. What could that possibly mean? Could this be going back to his confused expression when Ali told him about Charles’ grave at Aunt Carol’s? Could he know something that we don’t? And seriously, what was in that card? I hate when they don’t give us the details! Spencer sits alone at a meeting. Aria sees Ezra talking to Nicole. Sarah kisses Emily. And Papa D is at Aunt Carol’s because the card is ABSOLUTELY NUTS. OH MY GOD. This is the first time that Charles has spoken directly to anyone AS himself. Not A. Charles. Holy guacamole. I don’t even know what to say right now. He’s clearly digging to see what’s really in that grave. So. IN THREE EPISODES WE’LL FINALLY COME FACE TO FACE WITH CHARLES? Wait, this isn’t like the last time when they said we were going to see his face and then we didn’t, is it? Like, we’re actually going to see his face? I’m not interested in being let down again like that. My heart doesn’t have the time. So what did we learn this week, friends? That Charles is actually still alive? That Hanna was right all along? No body, no proof? Was Leslie just a speed bump? So many questions and not nearly enough answers. Such is the life of a Pretty Little Liars fan. Ugh. Until next week, my little liars!